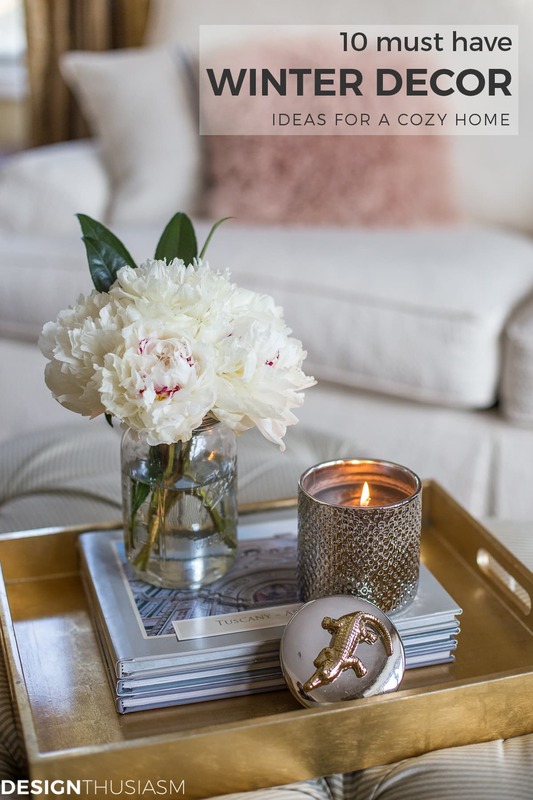 In this post: If you’re looking for winter decor ideas for after Christmas, these 10 ideas will help add warmth and coziness to your home. Winter decor after Christmas has a very special character in that it needs to feel comfy and cozy and yet at the same time reflect the icy look of outdoors. I love to use lots of white, but also the natural imagery of the outdoors, and the fabrics become warm and rich with textures and bulk. The following list presents 10 must-have winter decor ideas that will help you add that cozy feel to your home. You may already own quite a few of these items, but I’m including the links to options in case you’re looking to add them to your decor. 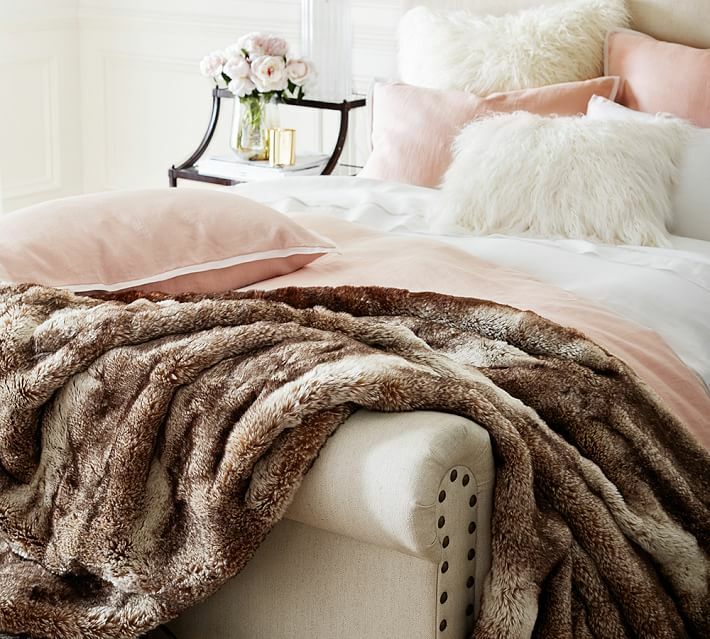 Nothing says winter quite like a faux fur blanket. Draped over a lush sectional sofa it pretty much calls out your name to curl up on the sofa with a cup of hot cocoa. All sweater knits ring true for this season, but especially fisherman knits and anything with cables. If it’s something you’d wear for a hike in the woods, it’s even better tossed on the couch to relax in front of the fire. Winter is a very textural season and bark is reminiscent of a snowy day outdoors. Wrapped around planters or other decor, it looks lovely with a white bouquet or an evergreen plant. Whether used in drapery panels or covering a piece of furniture, rich velvet exudes a feeling of warmth. Another reminder of the bare trees outside, twigs and branches looks great indoors. Throw in a few pine cones and you’ve got the perfect winter vignette. If you have snowflake ornaments left over from the holidays, they can still look pretty around the house. The imagery is pretty on pillows or bedding, as well. Deer, polar bears or other woodland creatures are the perfect motifs for winter decorating. Wooly fabrics always remind me of winter and the tweedier they are the better. Also tartans, buffalo checks and pinstripes would work well, too. I already mentioned the fisherman and cable knits, but the newer super chunky knit throws are awesome for your winter home. The icy look of mercury glass is prefect to reflect the winter light. In candlesticks and vases or other decor pieces, they fit right in for a winter look. Pick a few of these winter decor ideas and mix them up in a crisp white room or one decorated in icy pastels. Pour yourself a cup of hot chocolate, light a fire and say goodbye to the winter blues! I adore the Mongolian fur pillow! And I didn’t realize I could have used my mercury glass after Christmas! (Eyes rolling) Since the weather here in South Georgia has just recently dropped to the low 40’s, I am ready to snuggle and scroll through Pinterest by the fire! Great ideas for using cable knit sweaters! I just saw some at Goodwill and will be heading back to get them. Thanks for sharing your ideas! My pleasure!! So glad you enjoyed!